Blaise Tayese, 17, addresses his constituents after being elected governor at Buckeye Boys State. Blaise Tayese said he had a “once in a lifetime experience” as governor of American Legion Buckeye Boys State. The rising senior at Washington Court House was elected as this year’s governor of Buckeye Boys State, winning over 65 percent of the vote in a landslide victory. Tayese was one of six boys from Washington Court House High School who was selected to attend the eight-day program — held last week — during which 1,200 boys run their own miniature state government. American Legion Post 25 and Post 653 selected a total of 15 young men from Fayette County to participate this year. During the program, each boy has a job to do. Some are members of the legislature, while others man the National Guard, one writes the daily speeches which the governor delivers, and one even acts as the dog warden. The highest position in the government is that of governor. Once he was elected, Tayese found that the position of governor is a busy one. He spent his days signing bills, running assemblies, delivering speeches, and addressing the concerns of the constant stream of boys who came knocking at his office door. Tayese was tasked with signing bills that the House and Senate passed. He said he signed “a lot of good bills.” These included bills that would cover the care for individuals with autism with Medicaid and that would protect farmers. The bill he was most proud of was one that was meant to address the opioid crisis. The bill called for strict limits of the prescription of opioids and established a rehabilitation center to help individuals who are struggling with addiction. 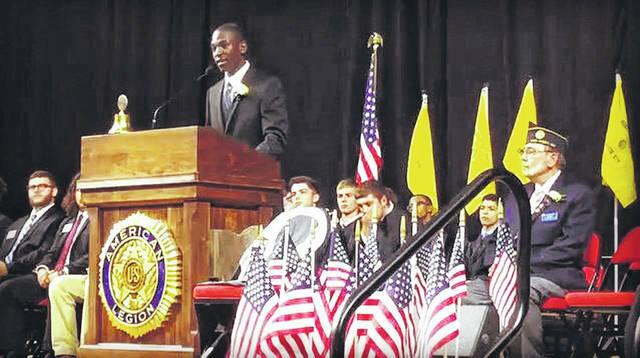 https://www.recordherald.com/wp-content/uploads/sites/27/2018/06/web1_blaise-tayese-governor-.jpgBlaise Tayese, 17, addresses his constituents after being elected governor at Buckeye Boys State.